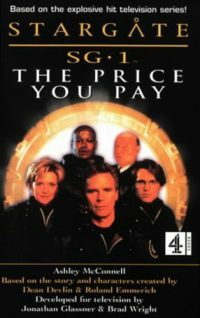 SG-1 is stranded on a world whose inhabitants have struck a pact with the Goa'uld -- host bodies in exchange for survival -- and seek to rescue a people who do not want their help. Eons ago, the evil forces of Apophis and his minions made a sinister pact with the people of the planet M’kwethet. The inhabitants of the primitive world would pay homage to their masters by way of tribute — providing their best and strongest specimens to the Goa’uld as host bodies for their young. By doing so, they would avert total annihilation … while the hosts would be doomed to a living death. For years, the helpless supplicants obeyed — and were sacrificed. It is on this world that Colonel Jack O’Neill and his SG-1 team find themselves stranded. With the new “payment” about to be sent, the unit struggles to rescue a terrified populace that does not want help, while facing the possibility of being marooned forever. But one fact overshadows all else — the Goa’uld are on their way, and O’Neill and his team must make the ultimate sacrifice.